No time? FIND the time! I have a few friends whose weddings are coming up very soon, so they are really in the thick of planning and making decisions and watching everything come together. I’m jealous! I wish that were me! Two years is such a long time to wait for such an awesome life-changing event! I should, however, disclose that it won’t be as life-changing as it would be if we lived separate lives. The boy and I have been living together for about a year now, so life pretty much has a pattern, and we are comfortable in that pattern now. Not too much is new, or different, but we like it that way. I couldn’t imagine going through the stress of a wedding only to immediately live with someone, whose day-to-day habits are completely unfamiliar. To those of you who don’t live together, but will, get ready for the ride of your life! I’ve certainly learned a lot over the past year, and we have grown much closer. Unfortunately, we also tend to fall into ruts. As with any couple as used to each other as we are, we each fall into our daily routines, and it seems like there really isn’t any “us” time. So, into our day-to-day lives, we have worked in some “us” time. It is SO important for any healthy relationship, and if you don’t think you have the time…FIND IT! 1) Watch TV together. Now this sounds SUPER lame. But that’s because you aren’t making it interactive. I know what’s going on. The TV is background noise while you’re texting your friends and he’s playing games on his laptop. Instead, pick a few shows that you both enjoy. You can either love the show, or mock it mercilessly. The Bachelorette/Bachelor/Bachelor Pad series’ are our favorites to mock and jeer at. C’mon ladies, you know you bond best when poking fun at reality TV stars who make way more money then you’ll ever hope to! We also share laughs while watching The New Girl, and go along on adventures with Dave and Cody in Dual Survival. 2) Cleaning the house together. I kid you not! Bonding time for sure! Really any project done together is bonding time, but cleaning the house is something that happens every week. It feels great to work together to accomplish a final goal, even something as small as cleaning. 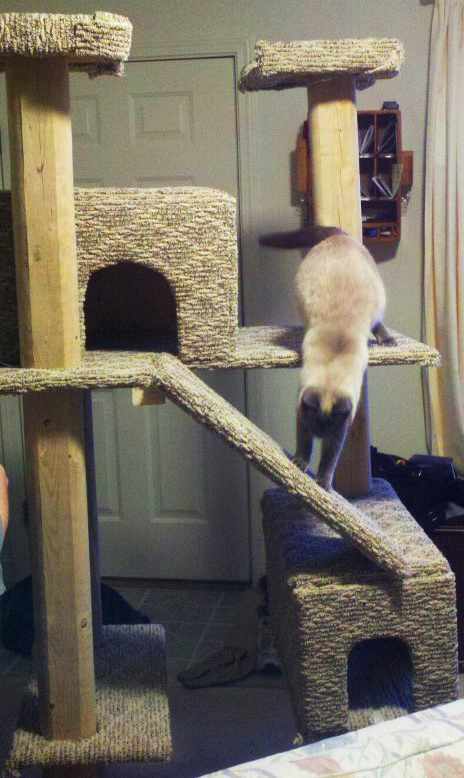 The coolest project we’ve ever done together was build our wonderful cat Evie B a kitty condo. If you were thinking of ordering one on-line forget about it! They are super flimsy. I wasn’t so sure he could build anything at first, to be honest with you. I had never really seen him pick up a hammer before, so when he suggested he had the ability to build an elaborate kitty condo, I was a little leery But I trusted, we scraped together money to buy materials, planned it out, and it turned out to be SO awesome. Evie B. LOVES the thing. The best part about it, as cheesy as this will sound, is that we did it together. All those “trust building” exercises you did in dumb high school programs were obviously right on. Working together toward a common end, brings people closer together. 3) Communicate. Often. It’s a little silly that this needs to be said, but I think when we are going about our day, it’s easy to forget the other person. It’s kind of ridiculous how much the boy and I text back and forth during the day, even if it’s just to say, “I love you.” We ask each other about how our day is going, and he is the first person I want to talk to if I have any interesting news, even if it’s as dumb as, “You should SEE the cat right now! She is SO cute!” We both work long hours, and it helps us stay connected throughout the day, even if we can’t see each other. 4) Work out together! That is something that is actually a lot of fun, it sometimes even becomes a little bit of a competition. We push each other to get better running times, or get a better number of push ups, not to mention we are losing weight and spending time together! What’s cooler than that? 5) Cook together! This is something we do ALL the time! We both love to cook, and we love exploring new recipes! Since we make all our meals for the week on one day, we spend about 2 hours in the kitchen, just preparing and cooking everything! We make a good team. Here’s our latest kick, Guacamole! SO good! Having trouble thinking of things to do together? Try going here, there are A LOT of cheap and fun things to do as a couple! SO when the wedding planning gets stressful I’m going to have to say to myself, “Self, remember that post on finding time together? Don’t sacrifice any of those things! Remember what you are planning a wedding for.” Now quit reading and go and kiss your honey!